So I was sitting around last night watching the newest season of Master of None when I should have been figuring out what I was going to cook this week. But then inspiration hit when a character in the show made a joke about how bougie young women in NYC are obsessed with grain bowls. 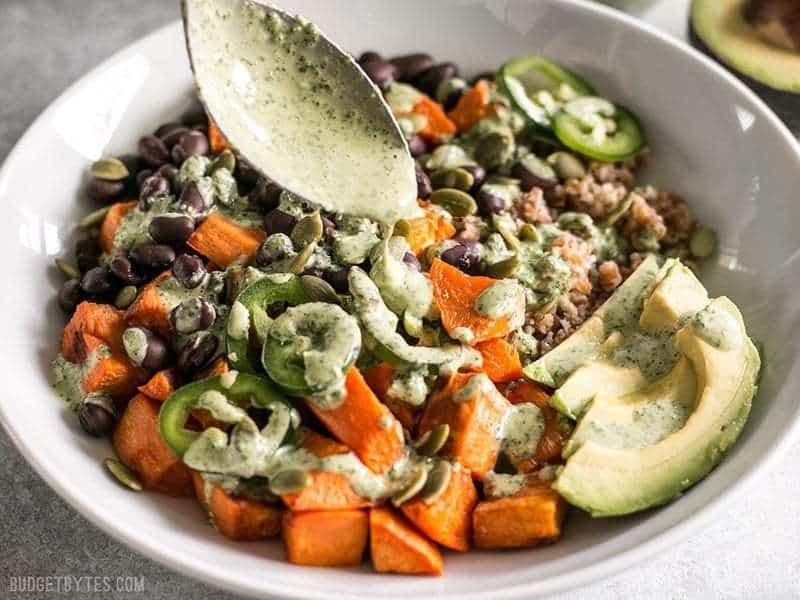 After my initial defensive, “Hey, grain bowls are delicious AND healthy!” my brain switched to, “Oh, I definitely need to make a grain bowl tomorrow.” So I spent the rest of the evening brainstorming about these Sweet Potato Grain Bowls with Green Tahini Sauce. Want more no-reheat lunch ideas? Check out our No-Reheat Meal Prep Recipe Archives! What is a “Grain Bowl”? A grain bowl is simply a salad that uses some type of cooked grain as the base instead of salad greens. They usually feature a variety of colors, textures, and flavors, which makes them super fun to eat and usually ends up offering a bunch of nutritional value in the process. The other great thing about grain bowls is that they’re perfect for meal prep, which is good because I seriously need to get back on track with my eating after traveling two out of the last three weeks. Ouch. Can I Use Other Grains for my Sweet Potato Grain Bowls? I started my Sweet Potato Grain Bowls with cooked bulgur because it’s cheap, easy to cook, and I absolutely love the flavor and texture. 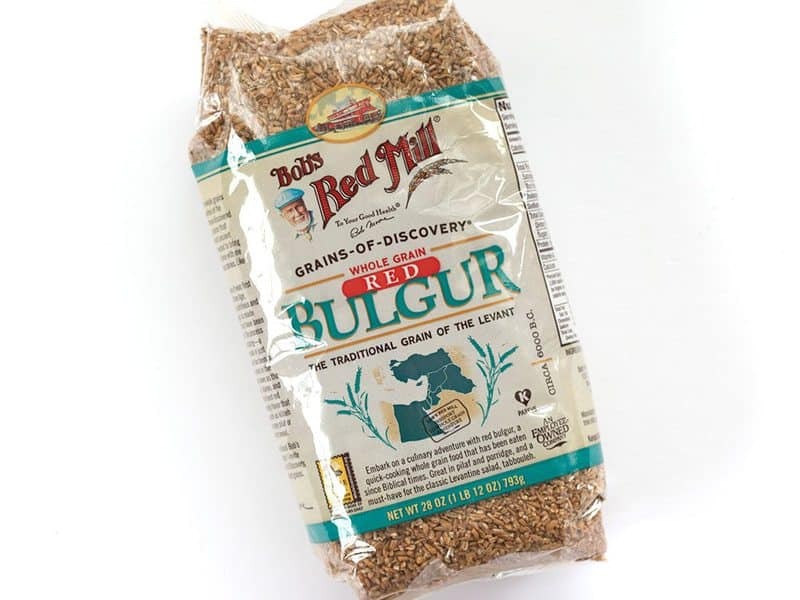 Bulgur is simply wheat berries that have been broken up into pieces (just like steel cut oats, but with wheat berries instead of oat berries). I love how the cooked texture is slightly chewy and the flavor is nutty. That being said, you can literally use any grain in its place. Brown or wild rice, farro, barley, or even quinoa (which is technically a seed). In a pinch, you can even do a tiny pasta like couscous or orzo. 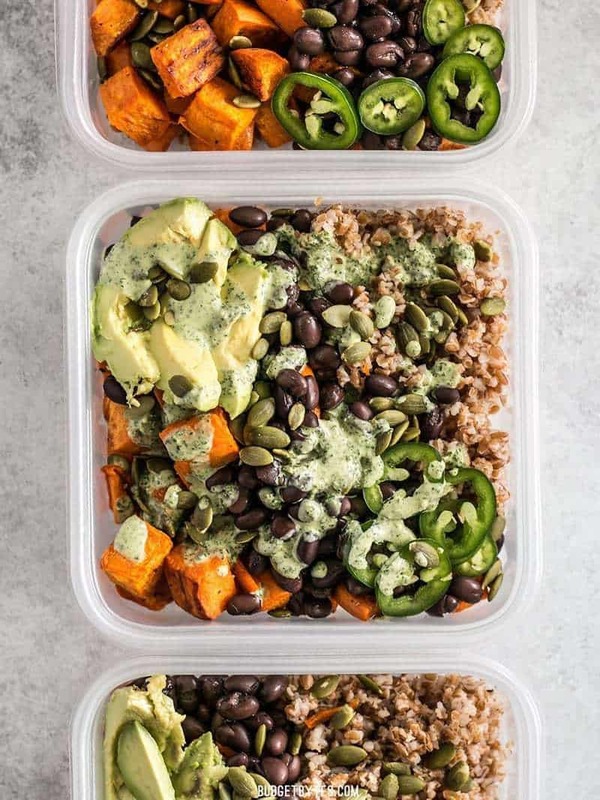 These Sweet Potato Grain Bowls with Green Tahini Sauce are prefect for meal prep and bursting with color, texture, and flavor! Add the uncooked bulgur to a sauce pot and place it over medium heat. 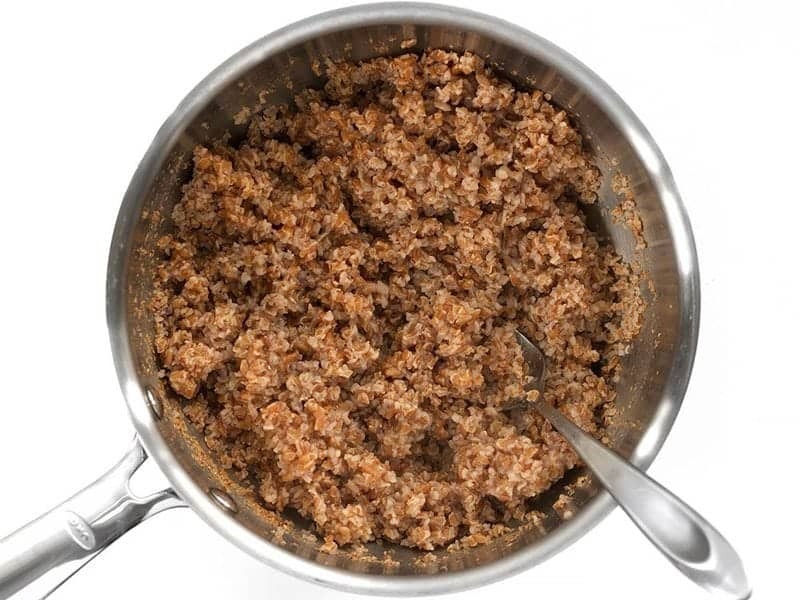 Cook and stir the dry bulgur over medium heat for 2-3 minutes, or until it smells toasty or nutty, then remove it from the heat. Add two cups of water, stir to combine, place a lid on top, then bring it to a boil over high heat. Once it reaches a boil, turn the heat down to low and let it simmer for about 12 minutes with the lid in place. Turn the heat off and let the bulgur rest for 5 minutes. Remove the lid from the pot and fluff the bulgur with a fork. Allow the bulgur to cool (I like to place it in the refrigerator without a lid to cool quickly and dry slightly). While the bulgur is simmering, preheat the oven to 400ºF. Peel and dice the sweet potatoes into 3/4-inch cubes. 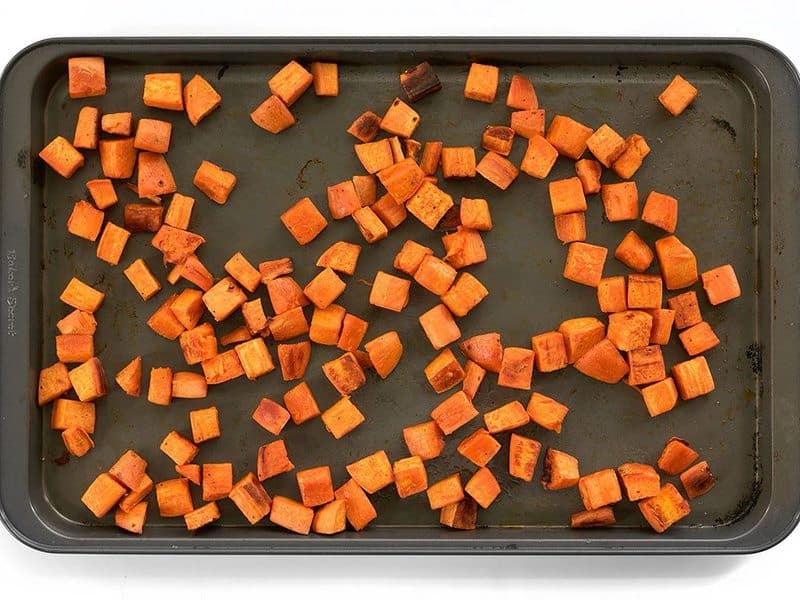 Place the cubed sweet potatoes on a large baking sheet and drizzle with olive oil. Add a pinch of salt and pepper, then toss the cubes until they are coated with oil. Roast the sweet potatoes in the preheated oven for 20 minutes, give them a stir, then roast for an additional 10 minutes or until they are soft and slightly browned on the edges. While the sweet potatoes are roasting, prepare the green tahini sauce. 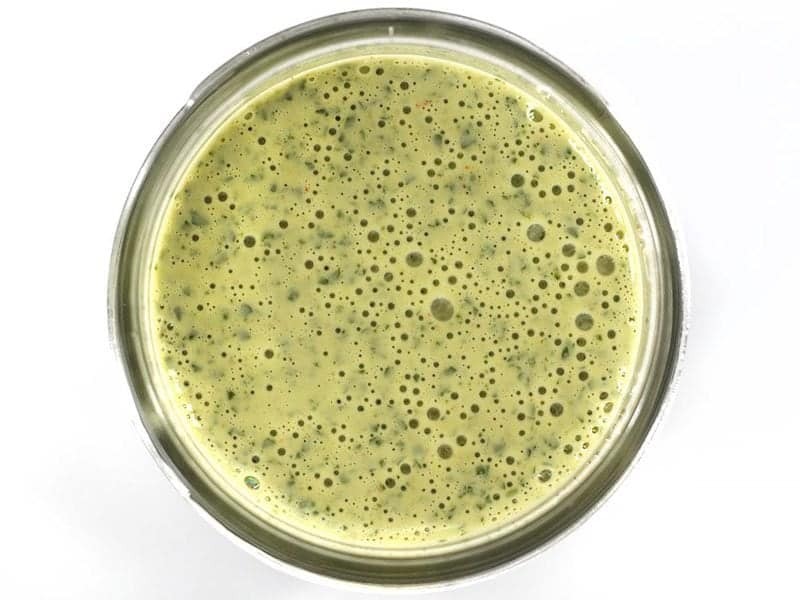 Place all the ingredients in a blender or food processor, and blend until the herbs are in very small pieces and the sauce becomes a light green color. Taste and adjust the salt if needed. Slice the avocado and jalapeño. Rinse and drain the black beans. To assemble the bowls, place 3/4-1 cup cooked and cooled bulgur in each bowl. 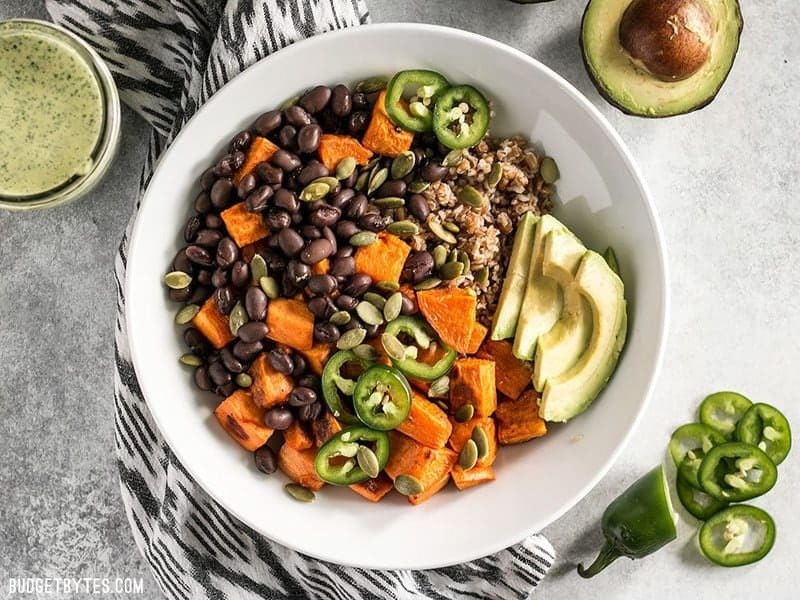 Divide the sweet potatoes, black beans, avocado, and jalapeño even among the bowls. Sprinkle about 1 Tbsp pepitas over each bowl, then drizzle the green tahini sauce over everything. Be generous with the green tahini sauce as it is responsible for much of the flavor in this dish. 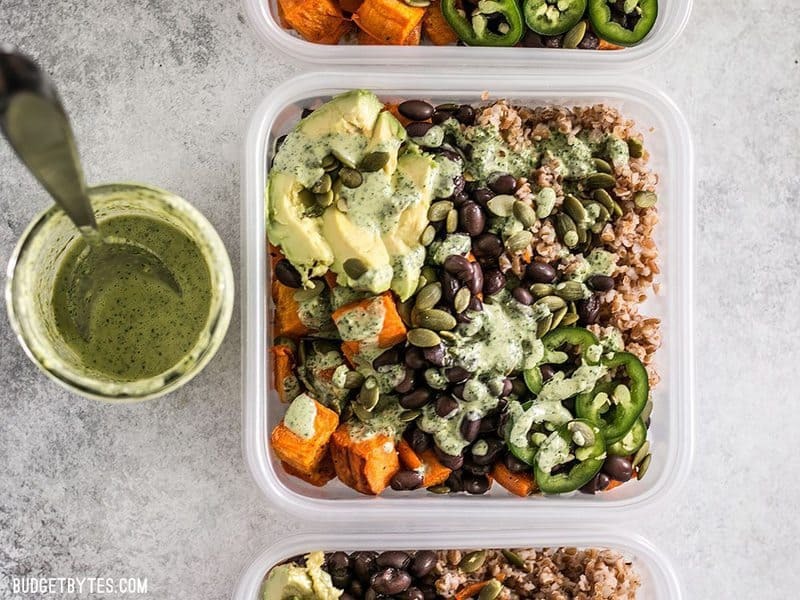 If meal prepping, keep the green tahini sauce separate until just before serving. *Any grain can be used in place of the bulgur. Just be sure to follow the cooking instructions on the package according to the grain used. Begin by cooking your grain so that it has time to cool. I use this bulgur because I love the flavor and texture, and it’s super easy to cook. 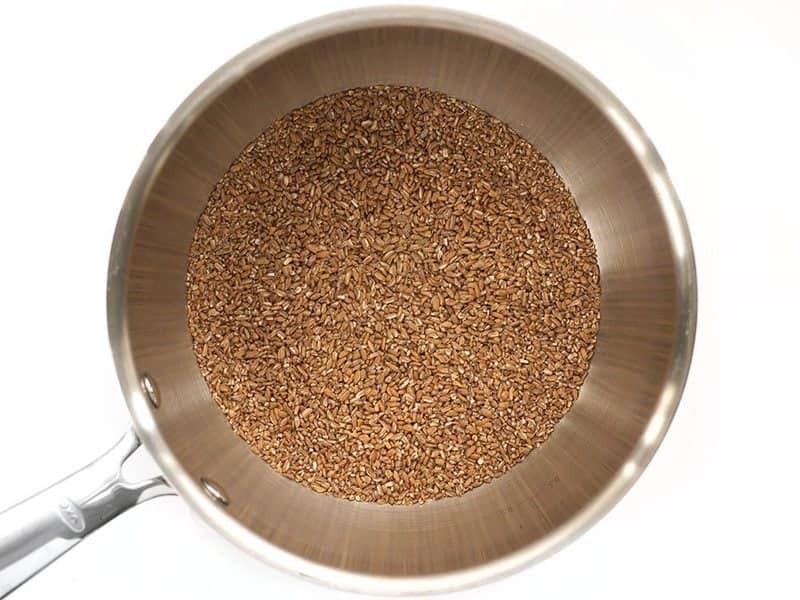 Dry toasting your grain before adding the water gives it just a bit more flavor. Add 1 cup dry bulgur to your sauce pot and place it over medium heat. Cook while stirring constantly for 2-3 minutes, or until you begin to smell a toasty or nutty flavor, then remove it from the heat. Add 2 cups water to the toasted bulgur, place a lid on the pot, then bring it up to a boil over high heat. Once it reaches a boil, turn the heat down to low and let it simmer for about 12 minutes. After 12 minutes, turn the heat off and let it rest for about five minutes. Finally, remove the lid and fluff it with a fork (pictured above). Let the bulgur cool. I like to place mine in the refrigerator without a lid to speed up the cooling and to dry it out just slightly. While the bulgur is simmering, preheat the oven to 400ºF. Peel and dice 2 lbs. sweet potatoes (about 3/4-inch cubes). Place them on a large baking sheet and drizzle with 2 Tbsp olive oil. Add a pinch of salt and pepper, then toss the cubes until they are coated in oil. 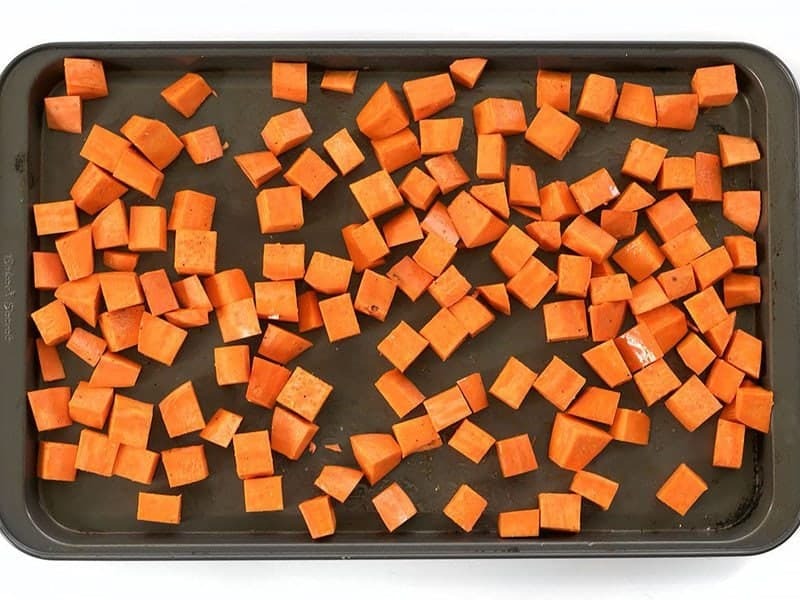 Roast the sweet potatoes in the preheated oven for 20 minutes, give them a stir, then roast for an additional 1o minutes, or until they are soft and slightly browned on the edges. While the sweet potatoes are roasting, prepare the green tahini sauce. Simply add 1/3 cup tahini, 1/3 cup water, 1/4 cup lemon juice, one clove of garlic, 1/2 tsp cumin, 1/4 tsp cayenne, 1/2 tsp salt, and one loosely pack cup each of cilantro leaves and parsley leaves to a food processor or blender. Blend the ingredients until the herbs are in tiny pieces and the sauce has taken on a light green hue. Taste and adjust the salt if needed. Rinse and drain a 15oz. can of black beans. Slice one avocado and one jalapeño. To assemble the bowls, place about 3/4 to 1 cup bulgur in each of four bowls. 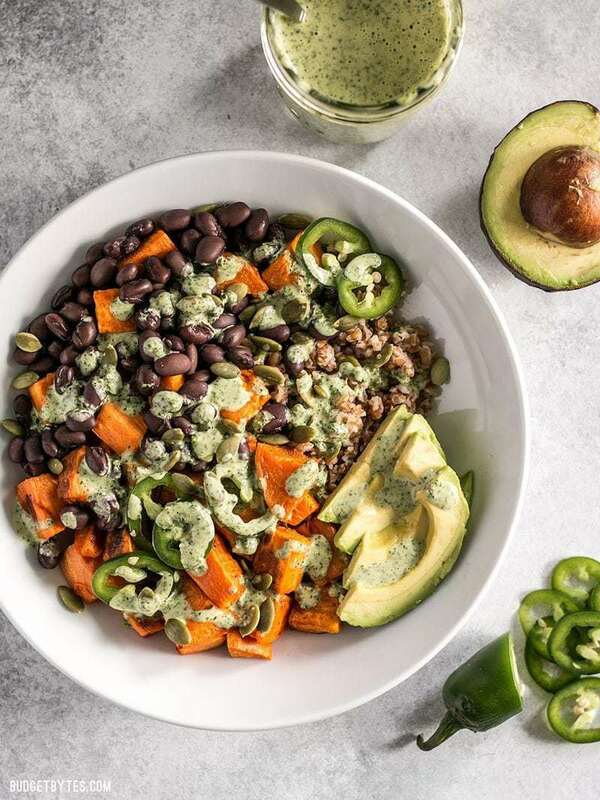 Divide the sweet potatoes, black beans, jalapeño, and avocado among the four bowls. Sprinkle 1 Tbsp pepitas on top of each bowl. I prepared one bowl in an actual bowl to eat for lunch today, and prepped the rest in three resealable containers for the fridge. I’ll be eating these Sweet Potato Grain Bowls cold. 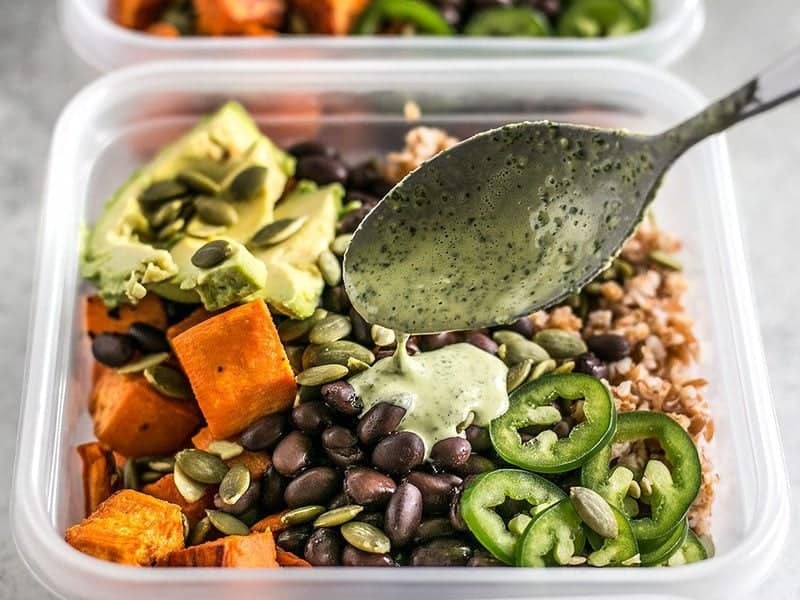 If you are meal prepping for the next few days, keep the green tahini sauce separate until just before serving. Otherwise, drizzle the sauce over each bowl. Be generous with the sauce because that’s where most of your flavor is coming in! The sauce is bright and tangy, but not at all too heavy like cream based sauces. Oh my, this is good! My husband took two bites and said, “this is great, even if it’s vegan.” I hadn’t realized it was vegan until then. This is a wonderful dinner, and the leftovers will be lunch for both of us tomorrow. In the San Francisco neighborhood where I work, I could pay $20 for this at a salad place. Thanks, Beth! This recipe has some good potential and the tahini sauce was fantastic. Next time, I’m going to add some spices to the sweet potatoes before cooking and will do something to the beans rather than just adding them in plain. Maybe frying them up quickly with some spices and frozen corn? There wasn’t quite enough flavour to make this the kind of recipe I’d be excited to eat several days in a row, but it’s a great base recipe that comes together quickly and with some inexpensive staples I typically have on hand already. Definitely recommend adding the avocado right before eating as opposed to prepping in advance. This was a fantastic recipe that just happened because we had everything in it on hand (sans the bulgur – I opted for farro from Trader Joe’s!). It was super easy to prep, and I’m looking forward to having a vegetarian dish in our week’s menu. This was really delicious. By Day 4, I was still really excited to get to eat it for lunch. That’s saying a lot for a recipe! I used 1/2 an avocado for each bowl because I was too worried about what Day 4 avocado would look like (and based on what a Day 2 avocado looked like, I think I made the right decision for myself). So this way I would halve an avocado in the morning and then eat it over two days. I also added about 1/4 cup of cubed feta to each bowl because I love cheese and wanted to make sure it would be filling enough for me. The sauce is very forgiving because I totally messed it up and it was still delicious. I added too much garlic (usually I add extra garlci to recipes but I forgot that the garlic was staying raw in this recipe which is a whole different ball game) and then too many greens and then had to add extra water to compensate for how thick it got. I will definitely make this again (except I’ll do a better job with the dressing :P). Wow, loved this sauce! I substituted quinoa for bulgur and cubed chicken breast for black beans. I know both make it more expensive, but I already had the quinoa and frozen chicken. Looking forward to the rest of my meal prep! Fantastic recipe! It’s way more than the sum of it’s parts. I used quinoa instead of bulgur and added some leftover pickled onions and sauteed kale (both recipes from this site) to the mix. My girlfriend and I were still excited for this dinner three nights in. Chimichurri style sauces like this one make everything delicious. I made this for our dinner last night and we loved it. Had everything prepped before we left for a class then it was quick to assemble. You are right that the Green Tahini Sauce was the secret sauce! This looks delicious, can i substitute the cilantro for another herb? Also, do you know the total calories? Cilantro brings a certain flavor but you could stick with just parsley or less cilantro. And sorry we do not offer nutritional information at this time. How long will this keep in the refrigerator ? Can’t wait to try it. I usually try to eat them up with about four days. Do you do anything to the avocado to prevent it from going brown when you use this as a meal prep? I don’t do anything special. Sliced avocados turn a little dark around the edges, but they don’t turn completely black/brown like mashed avocados do. Even though the color changes a bit the flavor doesn’t, so it doesn’t bother me. Hey! FARDO! You can use lime juice or lemon juice to help to prevent from the avocado going brown so easily. Same thing I do when do apple slices and also give a very nice different flavor and my kids love it. The citric is what helps to prenvent from going brown. The best trick I found for keeping avocado halves from going brown is to store then with a cut chunk of fresh RED onion in an airtight container in the fridge. I’ve had them for up to a week like that and they still were bright green and not turning brown. They may last longer but I usually eat them all by then. Hope this helps! This is ridiculously good, and am already making it again. I am a sucker for great tahini sauce, and this sure fits the bill. Thank you for this! This turned out great for this week’s meal prepped lunches! Mixed it up a bit based on what I already had in the pantry: chickpeas instead of black beans and a batch of your SNAP seasoned brown rice instead of bulgur. Oh, and as one of the other commenters said, I did the sweet potato in a skillet to avoid turning on the oven in the August heat :) Tahini-based sauces are pretty hit-or-miss for me and this one turned out great – very zippy with all of the fresh herbs. Another BB hit!